Join us Thursday, February 5 at 7pm for our community-wide Open House. 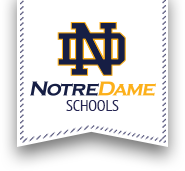 All are welcome to learn about the exciting and unique opportunities at Notre Dame Jr./Sr. High School. We hope you will take the time to tour our facilities, and meet our faculty, coaches and students.